Welcome to the next segment of our 2019 #TravelTuesday series: Traveling with Grace. Today Grace heads to Oregon. Mt. 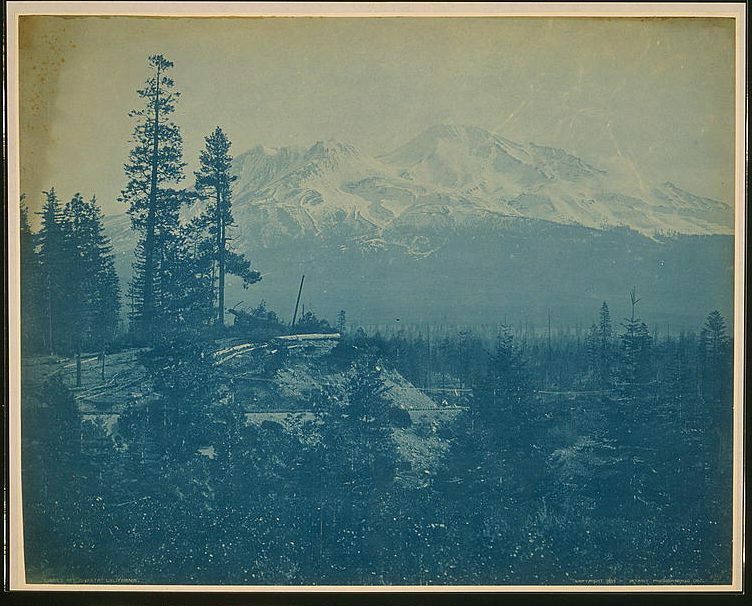 Shasta, c. 1899. Created by Detroit Publishing Co., courtesy of the Library of Congress. July 27, 1924: It was quite warm on the train during the day but grew cool towards evening and our stateroom was cool all night. I say out on the observation platform for about five hours. The first place of interest we passed this morning was Castle Crags, a huge mass of rugged towers and turrets like a ghostly fortress looming up against the sky. We rode for several hours along the Sacramento river. A little later on we came to a succession of small waterfalls and cascades known as Shasta Springs and here I tasted the water something like apolanaris, with plenty of soda in it. At 12:15 P.M. we came in sight of Mt. Shasta 14,400 odd ft. elevation, standing out distinct on every side, with a little snow on its crest. Across from this is another mt. a little less in height and cone shaped called Black Butte and although they say it often snows on it no snow even remains upon it owing they claim to its warm temperature and volcanic origin. Mr. Shasta was visible for several hours first on one side of us then the other as the train curved around until finally it faded away in the distance. At Ashland we saw the Lythia springs right across from the station. Much of northern California and southeastern Oregon is extremely arid. 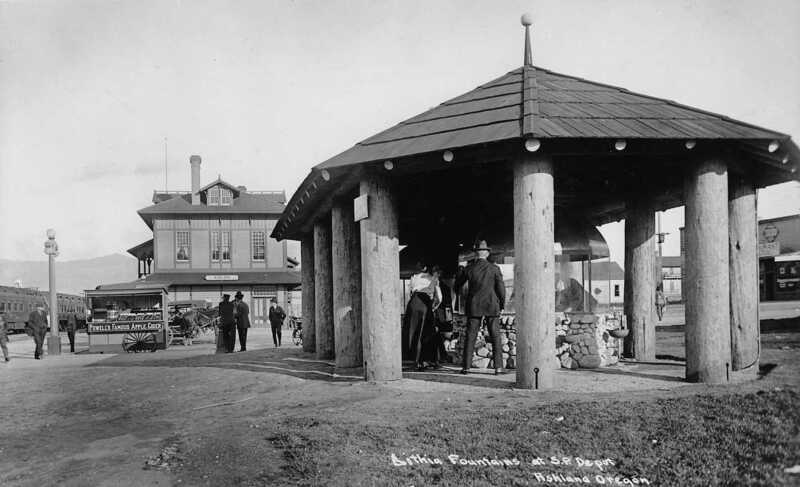 Lithia Water at the railroad station on “A” street, c. 1915. Courtesy of the Terry Skibby Collection. City of Ashland. Downtown Portland, c. 1924 (SW Morrison Street). City of Portland (OR) Archives, A2004-002.582, via. 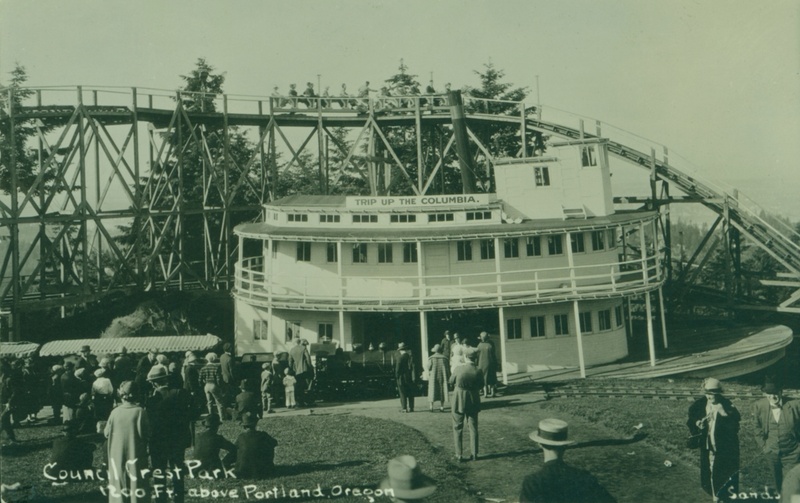 July 28, 1924: Arrived in Portland at 7:15 A.M. and took breakfast at the station. Then came here to the Multnomah Hotel. After luncheon we took an auto ride thru the business and residential sections of the city, in the latter district many of the sidewalks are lined with the pink and red rose bushes for which Portland is noted, and there are many other flowers as well. Some of the points of interest shown us were: Municipal Auditorium, Forestry Building (a huge log cabin in ornamental design, reminder of Lewis and Clark Exposition), the city park of about 20 acres attractively laid out with flower beds, hilly and wooded with zoo and recreation grounds where we saw the bronze statues “Coming of the White Man” and “Sacajawea.” From Kings Heights, a fine residential district, we had a splendid panoramic view of the city below, the Willamette and Columbia rivers in the foreground bonding the peninsula of East Portland (to which we crossed afterward on the bridge) and the mts. in the distance. Washington Park, c. 1925. City of Portland (OR) Archives, A2004-002.1397, via. Vista House, southwest elevation. Courtesy of the Library of Congress. July 29, 1924: We left at 9:30 A.M. for the Columbia River Highway going first along the Sandy Blvd, which skirts the Sandy river, a shallow yellow stream emptying into the Columbia. 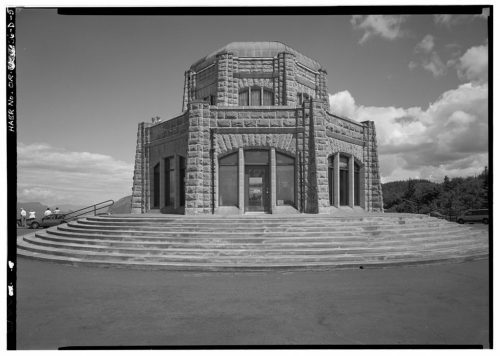 On entering the highway we stopped at the Vista House, a round ornamental stone structure built as a memorial to the Oregon pioneers, where an excellent view is had of the Columbia in both directions and across to the state of Washington which is separated from Oregon by this river. A remarkable engineering feat of this highway is what is known as the figure 8 consisting of eight loops in the road. The first falls we meet are the Latourell. Next we come to a little park known as Shepperd’s Dell, bought by a man of that name as a memorial to his wife, here is another beautiful waterfall, rocks, trees, farms, and flowers. Beyond this is Mushroom Rock otherwise known as Bishop’s Cay on account of its shape. The huge rocks along the way are interesting because of their composition which is plainly visible, they are composed of many kinds of mineral deposits crushed in bits by mighty glaciers, then welded together under pressure of intense heat in the geological periods. Bridal Veil Falls has been disrupted into flumes by a lumber company. On our way up we saw the logs being driven along the flumes to the river below and coming back we saw part of the water restored to its natural course, the work having stopped for the day. Mist Falls as its name indicates, resembles a shower of fine spray. Then there are [Dablon? ], Wahkeena and Multnomah Falls, the latter the biggest in U.S. next to the Yosemite, and Horsetail Falls, named because of the peculiar turns it takes in its descent. Oneonta Gorge is a narrow ravine between perpendicular walls of moss and fern covered rocks thru which a little stream runs from a fall ¼ mile back of the highway. St. Peter’s Dome rears its rounded surface high above the surrounding cliffs on the highway and in front of it is Cathedral Column, a petrified tree is to be seen close the the road. We visited a salmon and a rainbow trout hatchery, saw a fish wheel and fed the trout rolls, they are ravenous eaters. After lunch at the Columbia Gorge we went up to Hood river and saw the famous apple orchards. From here can be seen Mts. Hood and Ada, both capped with snow. Passed under Mitchell [Point] tunnel with its [???? ], all blown out of the solid rock, a very beautiful piece of work. From the Gorge Hotel can be seen the cascades of the Columbia around which the government has constructed locks. It is 200 ft. above the river set in a beautiful park overlooking Wah-Gwin-Gwin Falls, a finer view is to be had of the palisades on the opposite side of the river. Hops and loganberries from a large percentage of the crops raised in Oregon. 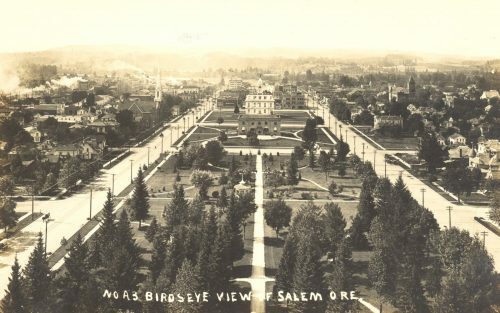 Bird’s eye view of Salem, Oregon before 1912. Image via. July 30, 1924: Took the stage at 10: A.M. for Salem. A very pretty ride along the Willamette River as far as Oregon City a big lumber center. Saw many log booms along the river. Also passed thru Oswego City. Road splendid all the way to Salem, a distance of 50 miles. On the stage we met a Mr. Director who keeps a clothing store in Salem, and after we ate our lunch in a pretty little restaurant called the Gray Bell, he and his wife gave us a ride around the town in their car. The Capitol, [Boat?] House, Post Office, are all five buildings set in a beautiful park. We saw the state institutions for the insane, deaf, dumb and blind as well as the state penitentiary all surrounded by well kept lawns and flower gardens kept up by the inmates. All the people in these little towns have such a lot of civic pride and the wide, clean streets, neat houses and flowery gardens attest to it. Our man on the street who heard us admire the town stopped us and said, “You get this is a fine city and I hope you’ll stop here.” We took the stage back at 3:00 P.M. and arriving at the hotel found a lovely basket of fruit and box of delicious homemade candies from the Feldenheimers. Cousins Flora and Charlie called on us tonight. They are such lovely cordial people and extended us every hospitality. They are highly thought of in the community as many people have told us. Council Crest Amusement Park, 1926. Courtesy of the City of Portland, via. 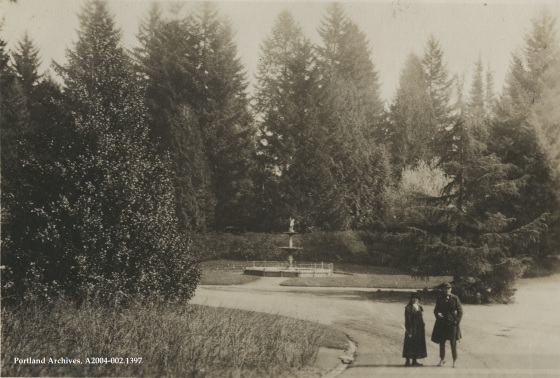 July 31, 1924: Cousin Flora and her son Elmer called for us in their car this afternoon and took us for a drive thru Portland’s better residential sections among which Portland Heights is one of the most attractive. The homes are very pretty, some stucco but most are frame, with lovely gardens and vine covered porches. The flowers grow everywhere in greatest profusion. We rode up to Council Crest the highest boulevard around the city where beautiful panoramas are unfolded below. We stopped at Cousin Flora’s home and she served us delicious refreshments. Elmer is a rather quiet young man but seems to be well educated. Tonight his cousin Paul came to see us at the hotel. 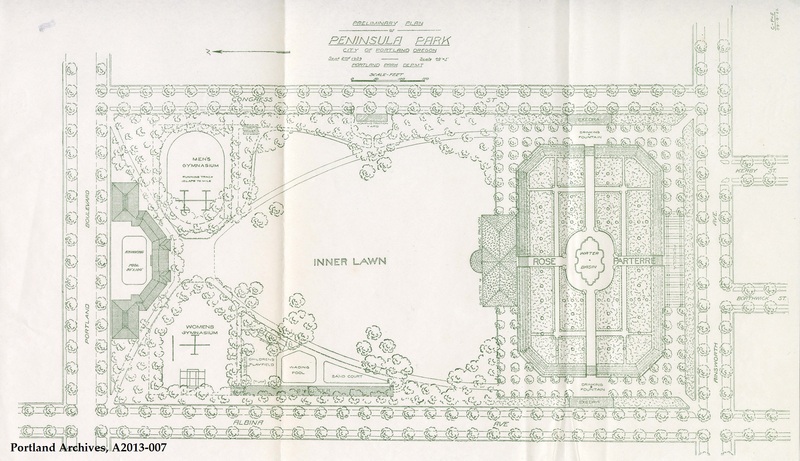 Preliminary plan for Peninsula Park, 1909. 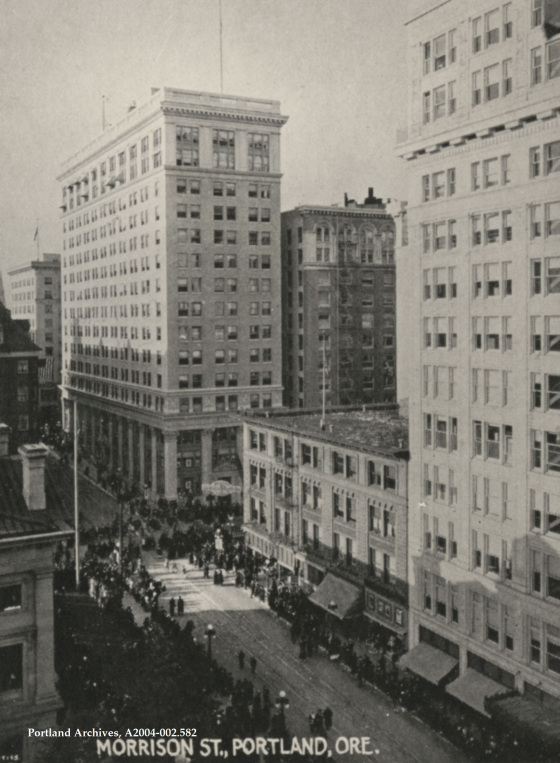 City of Portland (OR) Archives, A2013-007, 1909, via. August 1, 1924: This afternoon father and I took the street car and rode to Peninsula Park. Here is a very pretty sunken rose garden but it is not at its best now as the bushes are somewhat overgrown. There are also excellent playgrounds in this park as there are in almost every section of the city. There are a number of public tennis courts and Portland has one fine athletic club with a stadium all its own. Most of the homes are 2 or 3 floors high but there are also quite a few bungalows. Along the streets are a number of mountain ash trees, most decorative with their thick round clusters of wax-like red berries and bright green leaves and smooth, satiny bark. Cousin Flora sent us a bunch of varie-colored cosmos today. August 2, 1924: Cousin Flora sent me a big box of candies made of puffed rice and molasses. She came to see us this afternoon and brought us each a little gift from the store. Elmer dropped in for a few minutes before dinner. After dinner we talked a while with the Misses Rotholz and their father who have just come from Alaska. Later Cousin Rose F., her husband and son Paul, Cousin Flora and her husband came and spent the evening with us. Cousin Rose brought us more candy. The Feldenheimers have a very nice jewelry store in Portland. Some of the stores are very pretty but in the older business sections there are some wooden buildings which have a very ancient air. In some streets are big piles of slab and cord wood drying to burn. Lumber and salmon are the city’s chief industries. 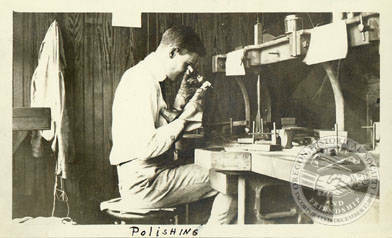 Paul Feldenheimer polishes stones at the A. Feldenheimer Jeweler and Goldsmith store in Portland, OR, c. 1920. 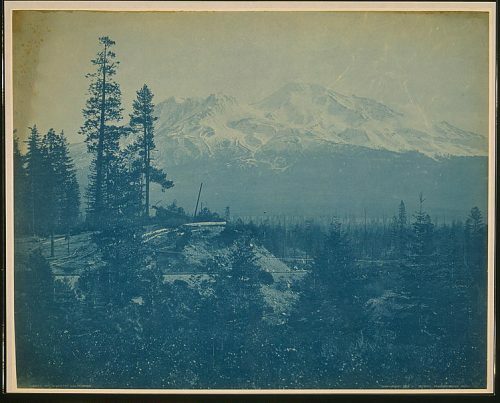 Courtesy of the Washington State University Libraries.